Bioluminescence (light produced by living animals or plants) is common among squid – it is estimated that two-thirds of all squid genera contain bioluminescent (light producing) species. Light production using photophores (special light producing structures) can be found nearly anywhere on the body of some squid species: the most common ones are: ocular (eye) photophores; on the mantle (head and arms also); visceral photophores, funnel photophores; and photophores on the tentacles. 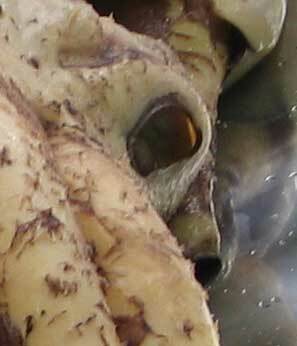 The colossal squid specimen has photophores at the rear of each eyeball (ocular photophores). Smaller related cranchid squid species have ocular photophores on the lower rim of the eye: some scientists think that the light is produced to reduce the animal’s silhouette against the lighter surface waters above, and thus avoid predators who may be swimming below. Many of these species are translucent, while the eye contains dark pigments which need to be shielded. 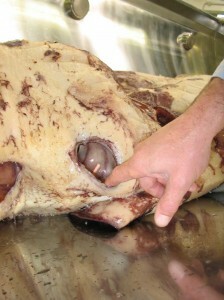 The ocular photophore of the colossal squid however, is located at the rear of the eye; hence it is unlikely to be used in the same manner as in its smaller cousins. We do not know how the colossal squid uses these photophores, but we can speculate that, used in conjunction with forward directed binocular vision, they may play an role in illuminating potential prey items in the total blackness of the ocean depths where the squid lives. The illumination provided by the photophores, combined with binocular vision enables the colossal squid to determine how far away its prey is before seizing it with its hooked tentacles. In contrast, the eyes of the giant squid are placed on the sides of the head, so giant squid do not have binocular vision, but instead can see both foward and behind, essential for detecting predators. Photophores are light emitting cells that range from simple clusters to more complex organs surrounded by reflectors, lenses, light guides, colour filters and muscles. Because only one eye out of six from the three specimens we have had for examination is intact, we chose not to dissect it, but rather preserve it for public display, so we cannot examine its structure and determine its function until further specimens are available! In a number of deep sea animals sexual dimorphism of photophores exists (males and females have different photophores), although the use and recognition of signals between the sexes is not yet understood by scientists – again, until a male colossal squid becomes available, the possibility of sexual dimorphism in colossal squid will remain a mystery. Vision in the ocean is more challenging than it is on land because the scattering and absorptive properties of water greatly shorten the distances that light travels and affects the visible colours differently. In clear ocean water, blue light travels the furthest and is, therefore, the wavelength most favoured for visual signalling, and is the dominant colour for bioluminescent emissions. The colour of the light from the colossal squid photophores is impossible to determine from the dead and preserved specimens – until somebody meets a live specimen, we may never know! Close-up of the light organ. © Copyright Museum of New Zealand Te Papa Tongarewa, 2008 . The light from the photophore is produced when a substance called a luciferin is oxidized in a chemical reaction with oxygen – this releases light and the luciferin becomes inactive until it is replaced by the animal. (This may be by the animal synthesizing the chemical itself, or by the prescence of symbiotic bacteria inside the photophore which produce the luciferin). The chemical reaction that releases the light produces virtually no heat. Until we can study the intact eye of another specimen, we will not know exactly how the colossal squid photophore functions.